Here is an example of our previous newsletter which we no longer produce. Our chapter is now included in the newsletter distributed by our parent organization FSG. This January saw some changes to our board - saying farewell to some and welcome to others. We would like to thank our past officers, Jean Gurucharri -Vice President, Patty Cueto - Treasurer and Heidi Enneking - Secretary, for the fine job you ladies gave our chapter. We appreciate your commitment to the WCFSG. We welcome in our new officers, Heidi Enneking as Vice President and Renee Davis as Treasurer! The position of Secretary is open at this time. Love to volunteer and think you would make a good officer to our chapter? Please send us an email and introduce yourself! 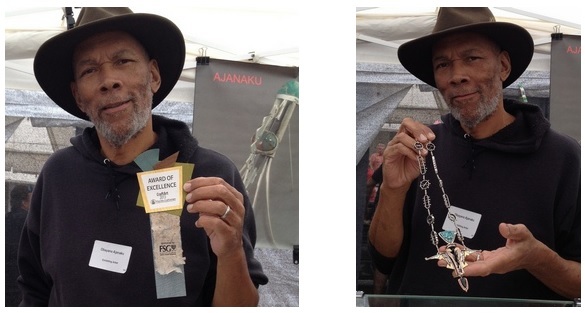 Our chapter was proud to sponsor the Florida Craftsmen's 2013 CraftArts Award of Excellence - Jewelry - with a $1000 prize going to the very talented Obayana Ajanaku. MARK YOUR CALENDARS AND DON'T MISS OUT! We are planning a Meet-N-Greet for our West Coast members at our Morean Arts Center Studio in downtown St. Petersburg! We invite you to join a gathering of other like-minded jewelry enthusiasts! Come see what our Morean studio has to offer! Join us Saturday May 3rd from 1:00 - 3:00. We'll have some sodas and bottled drinks to share, but please bring a snack to pass around. BYOB - wine and beer only please! Keeping with what we hope will become a much anticipated tradition, we've got a fun demo planned for the meet-n-greet that involves all of us! 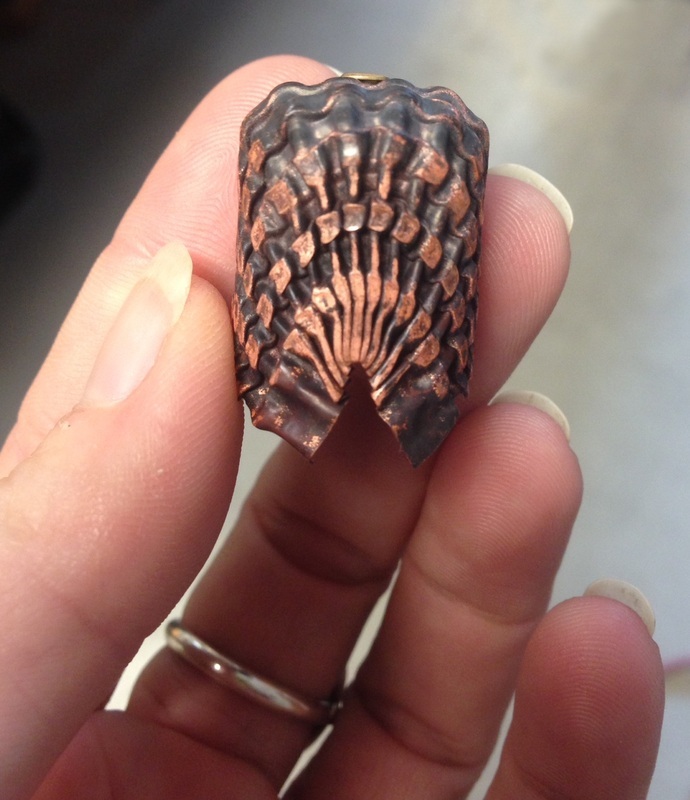 Where do folks get their inspiration for their jewelry designs? Bring one of your favorite creations and share what inspired you to create it! Our goal is to bring the WCFSG back to its members and we plan to host a minimum of one meet-n-greet at each of our partnered studios each year. The next one is planned for Summer 2014. Once again, we've got some great workshops! Check our website, www.wcfsg.com for details on this much anticipated annual event! The Florida Society of Goldsmiths is a not-for-profit organization created by metalsmiths to aid and support other metalsmiths through meetings, publicity, workshops and exhibitions; to provide metalsmiths with opportunities for education and exchange of information; to broaden public knowledge, awareness, and appreciation of fine quality handcrafted metal work, including, but not limited to, jewelry. Every June, we hold our annual fundraising auction at Wildacres. Fundraising allows us to continue to sponsor studios and provide education opportunities. Contributions are tax deductible. Would you like to contribute? 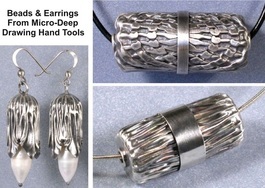 Art, jewelry-making tools and materials, stays in vacation homes, gift certificates, cabochons, gemstones, etc. Just about anything that will generate interest, we would love to offer at our auction! Please note that all donations must be made on or before June 7th. Thanks! John Cogswell - this November. Workshop content to-be-announced. 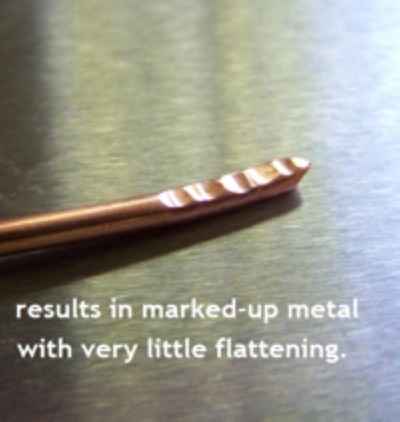 Clare and I spent two days with a great group of folks all wanting to learn more about metal corrugation in a workshop presented by Jack Berry at our beautiful DFAC Stirling Commons jewelry studio. 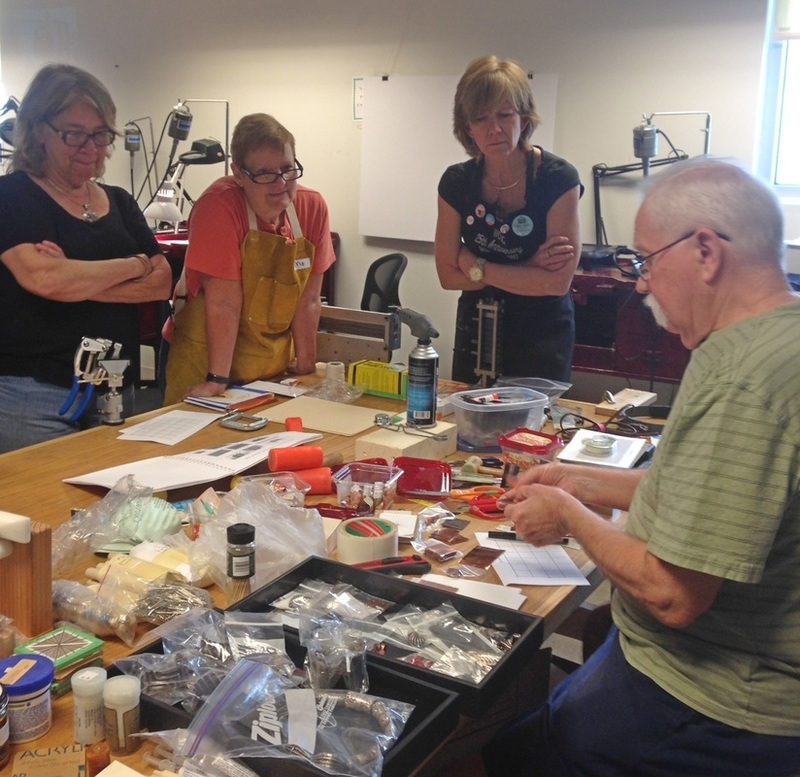 We learned to create beautiful beads with Jack's deep draw method using his own specially designed and affordable tools. Jack showed us how to create our own unique patterns for metal with or without the hydraulic press and creating wonderful flower-like designs for earrings and pendants. Jack's extensive knowledge, attention to detail and sense of humor made the workshop a fun-filled, informative and enjoyable weekend! The workshop was so popular that we asked Jack back again to share his knowledge with another group of enthusiastic folks. Here are some photos from the first workshop. Copper and silver are especially susceptible to oxidation, turning your copper brown like an old penny and your silver black. While it's generally known that to help keep your copper and silver jewelry from tarnishing, keeping it in a sealed plastic bag such as those made by Ziploc™ will help retard the process. So I applied this method for keeping my wire and sheet metal stock in better condition too which helps keep it ready to use. I store all the bags in a cloth-lined basket and arranged like file folders in order of wire or sheet stock gauge, largest to smallest. 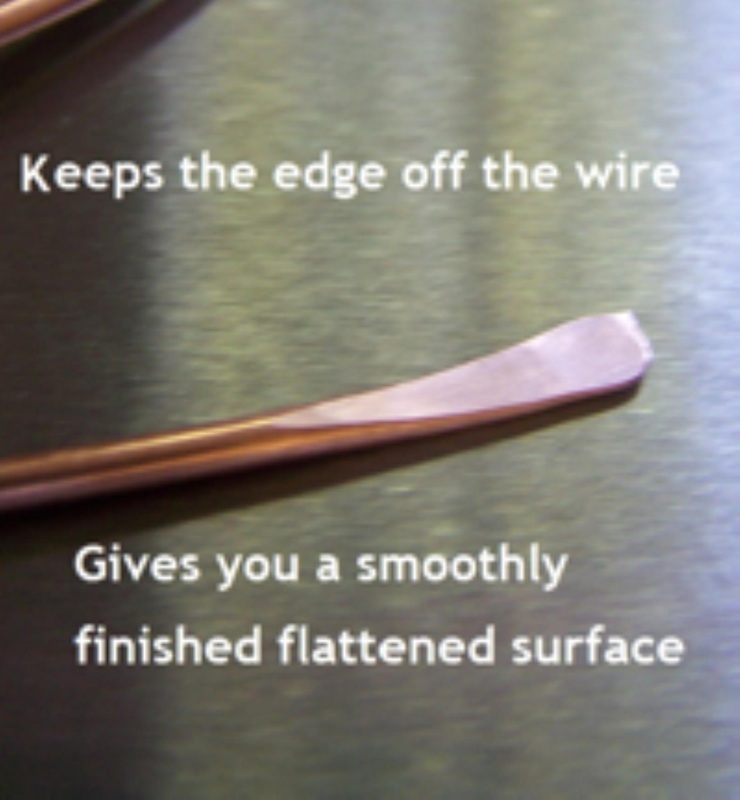 This really helps to keep the metal clean and tarnish-free...a real time saver as you won't have to clean the wire before using it. Works great for solders too!! One of the most common misuses of tools that I see in my classes is hammer handling. I repeatedly see students holding their hammers close to the tool's steel head. 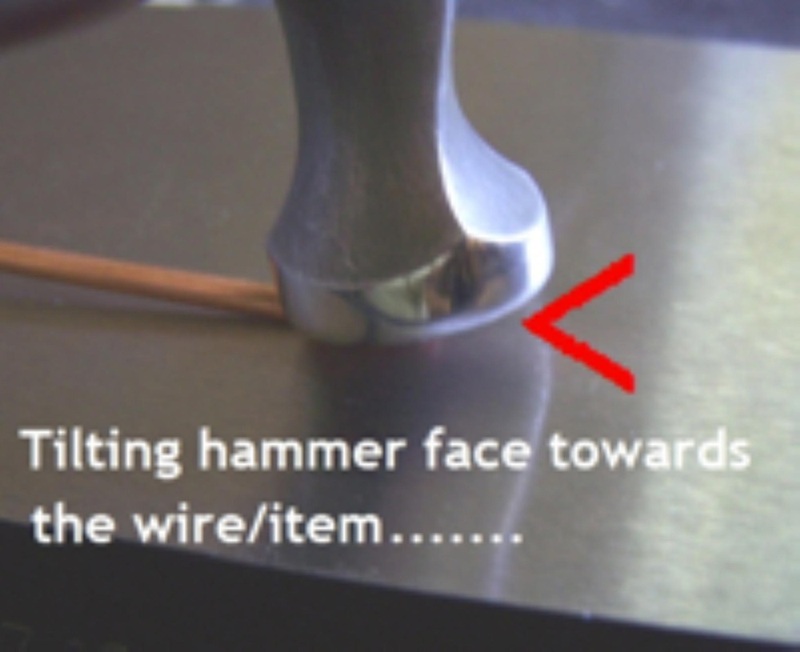 When a hammer is used this way it puts a lot of undue stress on the user's wrist and elbow. Hammers have a long handle for a reason. Back off and grip as far out on your handle as you comfortably can. (I think some of my students hear me say this even in their dreams, I repeat it so often). By gripping the hammer farther out towards the handle end, you let the momentum of the hammer do much of the work. And do not extend your index finger down the handle as this can cause injuries such as carpal tunnel syndrome. Not to contradict myself here, but when using a very heavy hammer, DO choke up on the handle to create a comfortable grip and balance of the weight of the hammer. This allows you to maximize the benefit of using a large hammer to move metal without causing undue stress to your body and by not causing muscle fatigue. Your wrist and arm and shoulder will tell you when you're gripping and applying the hammer correctly because it does not hurt! 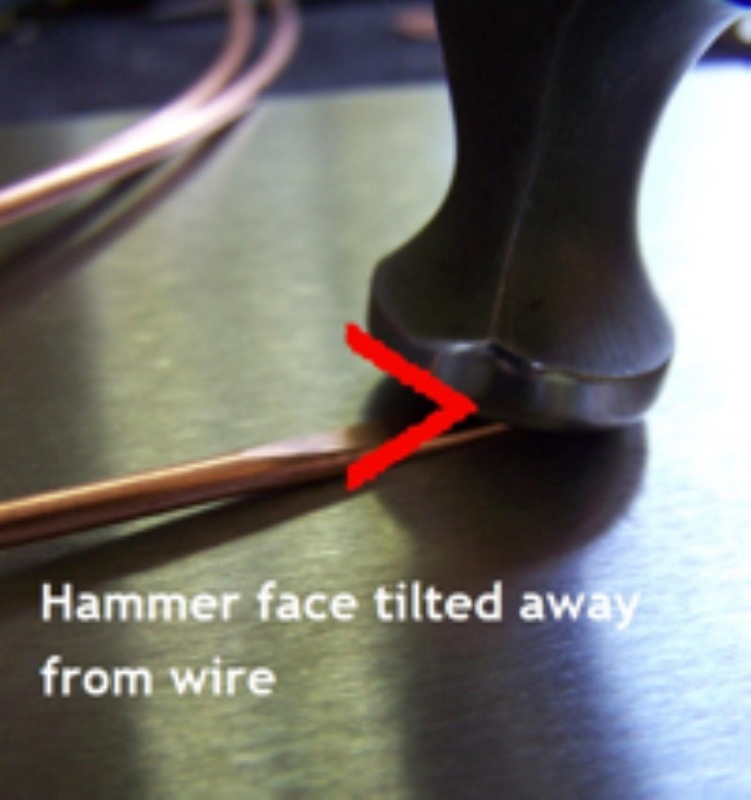 When flattening the end of a wire folks have a tendency to tilt the flat hammer face into the wire. This results in most of the force going into the hammer's edge, leaving marks on the metal and very little flattening. By tilting the hammer face slightly away from the body of the wire or metal the force of the blow is on the outside edge of the hammer face and the end of the wire. Finish the blow with a sliding motion toward the wire end. This leaves the end of the wire smooth, flat and free of hammer marks as shown. My hammer of choice for flatten wire stock is the ball pein. I prefer it over the chasing hammer for general hammering, especially on wire. Save your chasing hammer for stamping, repoussé and...chasing. 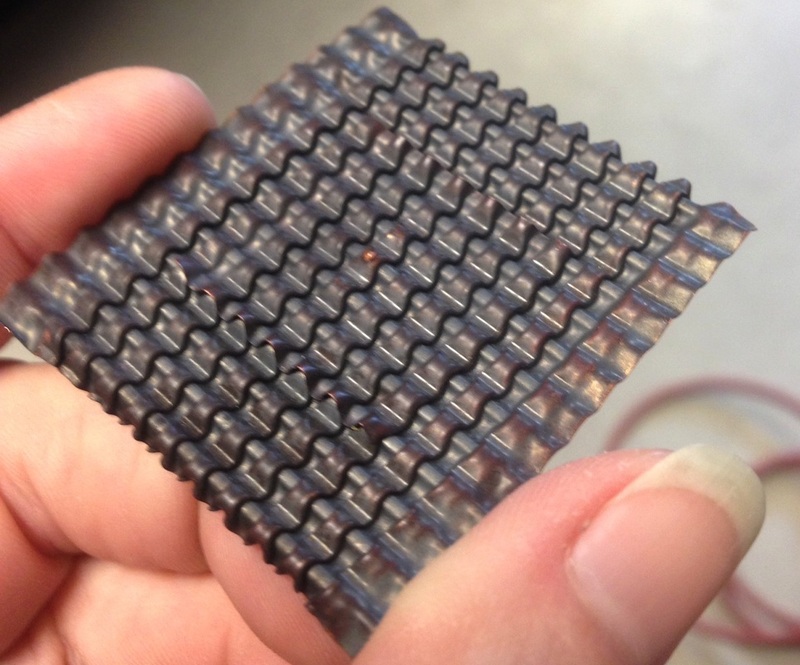 Have a great idea or bench trick to share? Please email us at westcoastfsg@gmail.com. Your tip may be featured in an upcoming newsletter! Did you know that there is a wide assortment of jewelry-making classes and workshops offered through our partnered Art Center studios for all skill levels of jewelry fabrication? We invite you to check them out and take advantage of our beautiful jewelry studios! In your area, classes and workshops are available at Art Center Manatee, Morean Arts Center and the Dunedin Fine Art Center. Check them out on-line to see what inspires your creative muse! We continue to add more equipment to our studios to help make your jewelry-making experiences all the better! We thank you for your continued support of this organization. Your membership fees and donations enable us to continue our mission of providing quality education in the jewelry arts! We currently have three gorgeous partnered jewelry studios for our members' enjoyment!! Keep an eye out for upcoming workshops and soon-to-be-scheduled member meetings at our partnered studios and take advantage of their great 6-week classes, workshops and open studios! Conveniently located throughout the Tampa Bay Area. Please stop by and say "hello!". 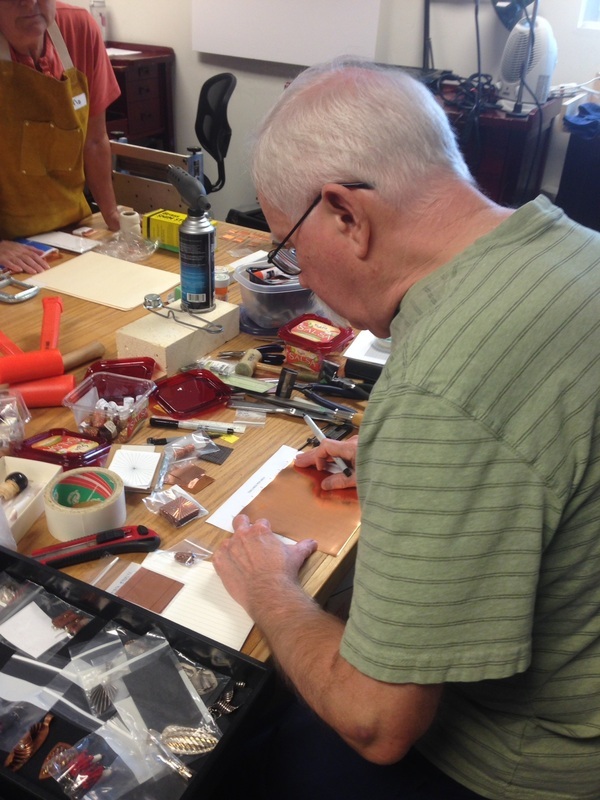 The days and times for the Open Studio vary and the art center sends out an email to members. Please call ACM for details.